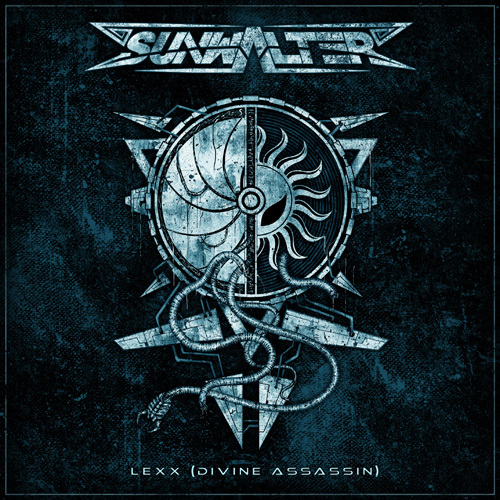 The SUNWALTER crew proudly present the new single: “Lexx (Divine Assassin)”. The song is dedicated to the Divine Assassin from the Light Universe. It was he, who we met on our way back from the Delphic Expanse after the fractal core formation, which serves as a portal between two Universes. This is a direct evidence of the existence of parallel Universes. Use the following LINK to listen to and download the track. Galactic thanks to Anton Trubin for the visuals! Collector's CD edition and other merchandise are available in our web-shop. 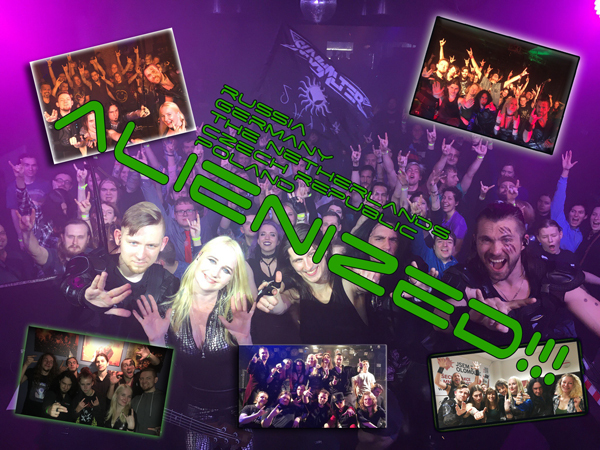 The second space journey dedicated to the support of Alien Hazard album is now considered complete. 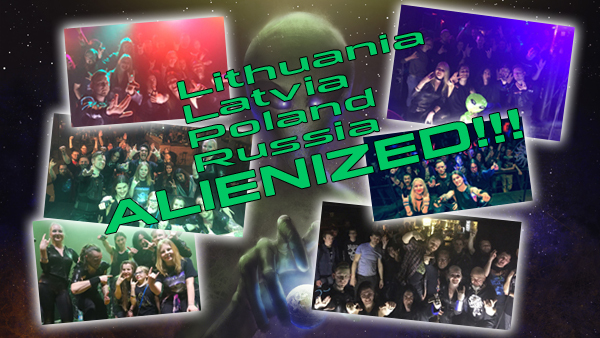 During this tour we played 8 gigs in different cities of Lithuania, Latvia, Poland and Russia. The SUNWALTER crew would like to thank everyone who rendered support at all these events! Now, our spaceship is far beyond the Solar System, and we are preparing new material under the careful guidance of the extraterrestrial races. For the purpose of informing the inhabitants of Earth most rapidly, we use our pages in social networks: VK, Facebook, Instagram, Youtube и Twitter. "The Course of the Alien King" — joint tour of Sunwalter and Lux Perpetua bands. Earthmen! Those of you, who watched our tour diary, must know that Lux Perpetua are some outstanding representatives of your race! 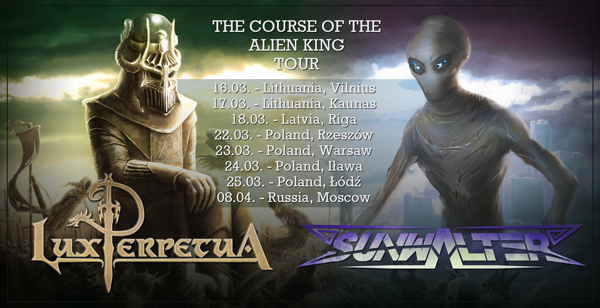 Our extraterrestrial patrons put a lot of hope upon the collaboration with them, that's why we decided to continue our joint operation in terms of "The Course of the Alien King" tour. During the tour, we are going to visit 7 cities in the territory of Lithuania, Latvia and Poland, and if the mission is successfully accomplished, we'll also land in the capital of Russia, and in some other large cities. Gig Dates on our website. 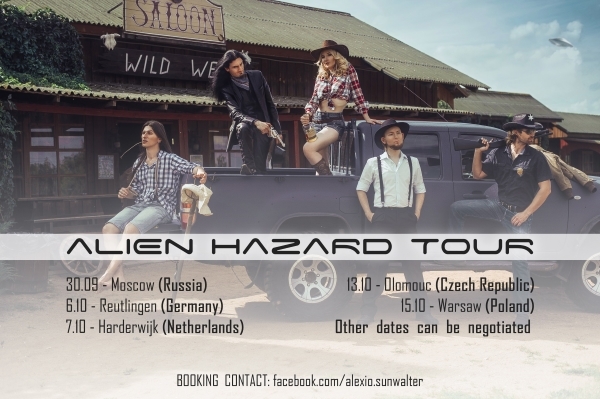 Upcoming dates of SUNWALTER shows as part of "Alien Hazard" album presentation and European tour. 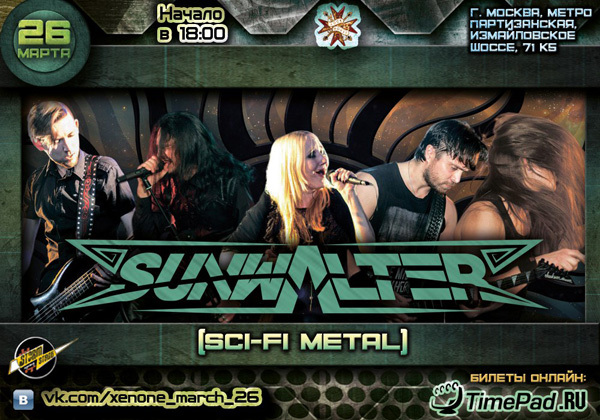 From the depths of the Universe, we, SUNWALTER sci-fi metal crew, transmit our long-awaited album! 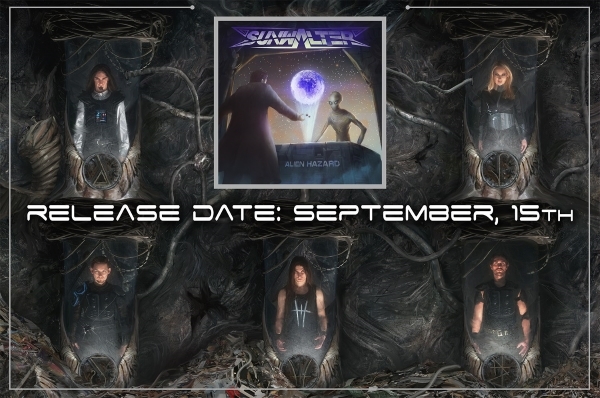 With the assistance of the Extraterrestrial Intelligence, guiding us all the time, we managed to bring into life this truly cosmic release titled "Alien Hazard". "...Many years ago high-ranking representatives of the Illuminati made a treaty with the majority of extraterrestrial races. 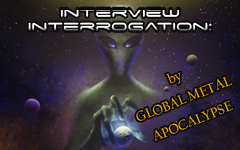 According to it, any contact between the extraterrestrial intelligence and Earthmen should be mediated by the Illuminati initiates. However, some delegates of alien races tend to ignore these agreements, thus opening a channel for unexpected contacts between Earthmen and the extraterrestrial intelligence. In precisely this way the members of the SUNWALTER band were abducted by the Grey and, upon returning to the Earth, appointed as secret interactive mediums maintaining cosmic contacts. The SUNWALTER band share all their knowledge, transmitted by the Grey, with the people of Earth by encrypting the messages in their songs. 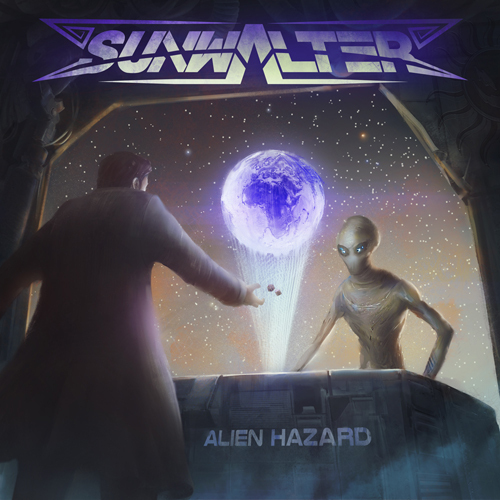 The "Alien Hazard" album deals with high stakes and risks, inevitably arising when those responsible for the Earth try to do business with extraterrestrial races. This relationship resembles a stressful game, where intergalactic leaders take part. Lots of secrets and puzzles of the Universe are still undiscovered for the Earthmen, but almost each song of the SUNWALTER band lifts this veil. The "Alien Hazard" album provides every person on the planet with new knowledge of the extraterrestrial reality, and even gives an answer for some sacral questions touching on the Solar system and our galaxy..."
Earthmen, residents of Mars and the Moon, as well as other representatives of the Universal intelligence! 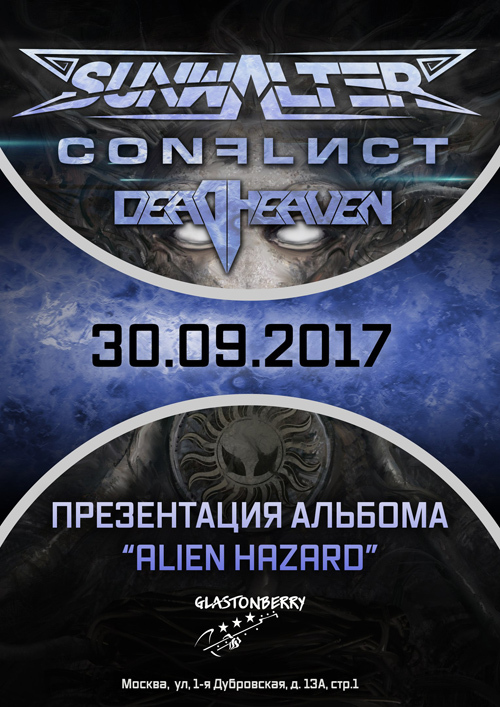 We have launched the preparation activities for the show dedicated to the presentation of our long-awaited "Alien Hazard" album. The event will take place on September 30th at Glastonberry club (large hall). We are going to share the stage with Deadheaven and CONFLICT bands. Together we'll create an unforgettable sci-fi atmosphere! Join the official event pages, so that you could keep up-to-date and by no means miss the performance. 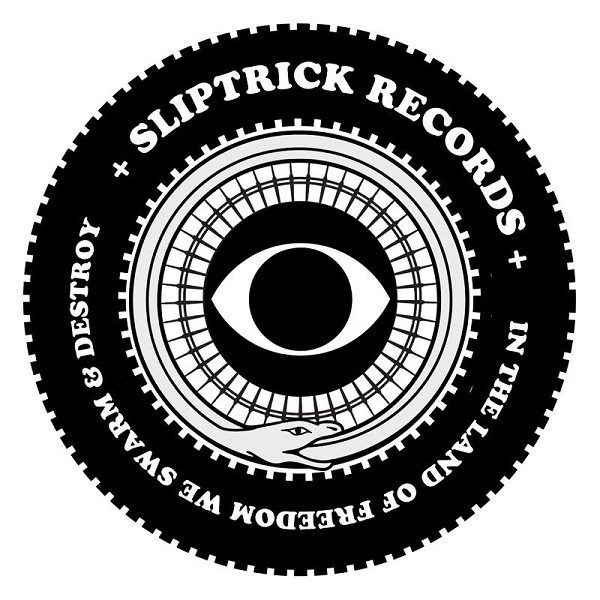 We are ready to announce officially the name of the terrestrial representative supporting our "Alien Hazard" album: please meet Sliptrick Records! Today we signed a contract on mutually beneficial conditions. Our new partners already have lots of noteworthy releases in the territory of Europe, USA and Japan. We hope this intergalactic collaboration bears fruit and success. Stay tuned, we'll announce the album release date in a short while. 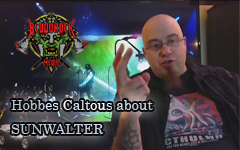 Here comes a backstage video from Sunwalter photo session. As promised, we report on our recent cowboy photo session. Jokes, understandable only for us, included! SUNWALTER in a different light! Dear friends! 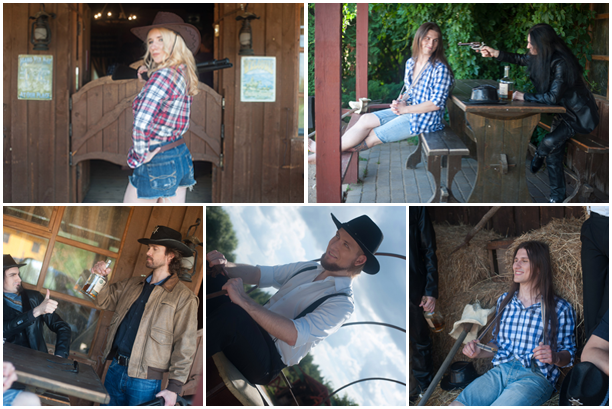 Some days ago we let ourselves fool about for a while and made a cowboy photo shoot session! Moreover, during the session we found a strange thing... We'll show it in the video as well. For now, here you have a couple of photos for a start. A while later we'll publish the main set of promo photos! Dear friends! 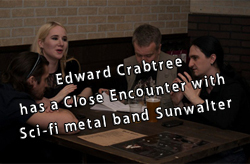 We've just got some fragments of the interview given by us on May 7th to Edward Crabtree. For now, only the original script is available (in English — Edward's mother tongue), but we are going to make the translation into Russian as soon as possible. The whole thing can be found here. Our dearest space friends! We are glad to announce our next show that will take place on March 26th (Saturday) at ROCK HOUSE club in support of Xe-None band. In addition to the concert program we have as usual prepared a couple of surprises for you. Join the corresponding VK group to get detailed information. Club location: Moscow (“Partizanskaya” metro station), Izmailovskoe highway, 71-5 (E). You can purchase a ticket from any member of our band or via feedback form.